Ellen Hendriksen: How to Rise Above Social Anxiety. Social anxiety. #ugh! It’s that constant voice of judgment and inadequacy that leaves you terrified of being “found out,” and stops you from sharing the real you. Guess what? You’re not alone. DR. ELLEN HENDRIKSEN is a clinical psychologist who helps millions calm their social anxiety and be their authentic selves. How? Through her award-winning podcast, Savvy Psychologist, in the clinic at Boston University’s Center for Anxiety and Related Disorders (CARD). 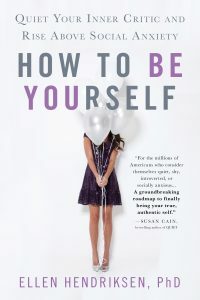 And, now through her groundbreaking book, HOW TO BE YOURSELF. Hendriksen earned her Ph.D. at UCLA and completed her training at Harvard Medical School. Her scientifically-based, zero-judgment approach has been featured in New York Magazine, The Observer, The Verge, Vice, Vox, Psychology Today, Scientific American, Susan Cain’s Quiet Revolution, and many other media outlets. Today, we dive into her personal journey with social anxiety, how an aspiring architect found her way into psychology and specialized in social anxiety and how to identify and work through this incredibly common, yet often disabling experience. Helix Sleep: Right now Helix is offering up to $125 dollars off ALL mattress orders at HelixSleep.com/GOODLIFE.